- Older versions of CRT Emudriver & Tools repository. - Be aware that newer GPUs don't have analog outputs. You can get 15 kHz support out of their HDMI ports, by means of a HDMI to VGA active adapter. However, video modes using low dotclocks will probably not work. Using super resolutions is the recommended solution. - For cards supported by several versions, the most recent one is recommended. - The standalone CRT Tools package may be used with previous versions of CRT Emudriver, both for Windows XP and Windows 7/8. Just make sure to generate a fresh video mode list using the new tools. - Just like any other feature, composite sync support can be enabled independently for boot time (BIOS mod with ATOM-15) and for Windows (with VMMaker). - In order to enable composite sync right from boot, you have to check the corresponding option in ATOM-15 and flash your video card with the modified BIOS. Composite sync will be applied to all available outputs, so that's something you may need to consider depending on your setup. - Regarding Windows, first of all, an important warning: enabling composite sync may be a tricky business. Even if you know what you're doing chances are you get into a messed video state at some point in the process. Once you get everything right it should work fine forever, you just need to get there. I recommend to always work with two monitors during the process and only enable composite sync on the secondary monitor (the one you're not working with) so in case anything goes wrong you don't get an unusable display. If anything goes wrong and you can't find your way around a messed display, you can boot in safe mode and uninstall the driver. - There's a new button in VMMaker's video card tab that allows you to toggle composite sync for the currently selected output. - Again, HD 5000+ cards are easier to setup for composite sync than legacy ones. Just enable composite sync for the selected output, create the modes and you're done. · First, to get consistent composite sync behaviour for legacy cards you must update CRT Emudriver (based on 12.6) to the new beta 12 version (this is not required for HD 5000+ cards). monitor "arcade_15", "Arcade 15.7 kHz - standard resolution", "4:3"
· Finally, still in VMMaker make sure to mark "Export settings to GroovyMAME" in MAME's tab so the correct polarities are used by GroovyMAME. - If you're using an VGA to BNC cable, remind that composite sync is ouput through the h-sync cable, so if you're using a T connector, unplug the v-sync cable. - [Emudriver] New driver packages based on Adrenalin 18.5.1. Lots of new AMD GPUs & APUs supported. Fixes support for 4K custom resolutions which is broken on official AMD drivers. - [Arcade OSD] Implemented new rendering backend based on Direct3D9Ex. This allows fluid page flipping on modern versions of Windows, making it possible to perform accurate refresh measurements again. It also fixes some compatibility issues. DirectDraw now is only used on Windows XP. - [VMMaker] Fixed bug that caused EDID emulation device list to appear empty. - [VMMaker] Fixed EDID emulation through HDMI for new GPUs, previously it caused unstability. - [VMMaker] Several bugs fixed regarding internal management of mode lists. - [Emudriver] Removed low pixel clock limitation on HDMI outputs. This allows outputting 15 kHz through HDMI in combination with HDMI->VGA active adapters. 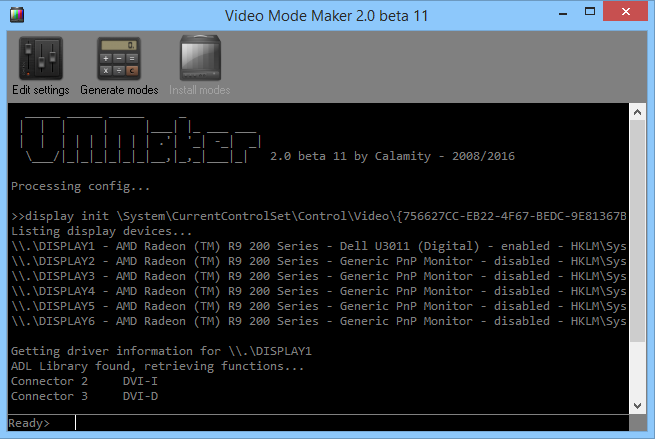 - [VMMaker] Added support for EDID emulation on digital outputs (HDMI and DVI-D). EDID emulation drop-down menu now shows outputs by type. DisplayPort still not supported. - [VMMaker] Support for pixelclocks up to 6 GHz. Modeline generation now possible from 15 kHz up to 8K fulldome. Bandwidth limitations imposed by drivers still apply. - [VMMaker] Fix XML processing of newer versions of MAME. - [VMMaker] Fix composite sync for HD 5000+ cards. - [VMMaker] Added support for composite sync. - [Emudriver] New fix to allow stable support for composite sync for legacy cards (only applies to package based on Catalyst 12.6). - [Emudriver] Disabled deflicker filter for interlaced modes. Now your interlaced modes will look perfectly sharp, with all their genuine flicker intact. - [VMMaker] Fixed bug that caused CRT Emudriver not being detected under Windows XP. - [VMMaker] Added new preset for 15/31 kHz dual-sync monitor. - [VMMaker] Added option to include multiple modelines in emulated EDID. When enabled, the current modelist is added to the EDID definition (maximum of 20 modes supported). If disabled, only a 640x480 modeline will be included, as usual. - [VMMaker] Fixed bug that caused newer video cards to be incorrectly detected as legacy ones. - [Emudriver] New driver packages based on Crimson 16.2.1. Lots of new AMD GPUs & APUs supported. - [Arcade OSD] Changes to correctly apply polarities and refresh with Crimson drivers. - [VMMaker] New commands available from the application's console, to allow manual management of the mode list, etc. Type "help" for details. - [Emudriver] Fixed bug in Setup preventing the driver from getting installed depending on the location of the installation files. - [Emudriver] Forced reset of interleave flag upon device power-up. Fixes problem with ATOM-15 flashed cards that caused a shrinked picture with progressive modes and double picture with interlaced modes. - [Emudriver] Fixed critical bug in driver that caused the system to get frozen randomly upon display device restart. - [Arcade OSD] Correctly assign sync polarity to AMD HD 5000+ cards. Because AMD documentation is wrong, VMMaker where assigning the polarities the wrong way. This must be the direct cause of most out-of-sync issues reported till now. What happened is that GM assigned positive sync instead of negative, and vice versa. This is fixed now, but you'll need to update your crt_range definitions. By default, negative sync (0) is what should be used in most cases. Thanks to intealls for doing proper checks with an oscilloscope and R-Typer for double-checking. - [VMMaker] ATI legacy: now interlaced modes are reported with full refresh (not halved) in W7+. This should solve problems with games that use a hardcoded 60 Hz refresh. - [VMMaker] Better alignment of modeline generator to GroovyMAME's. - [Arcade OSD] Fixed Powerstrip support. - [Emudriver] Added missing dlls for ADL library (thanks to Fonki for reporting). Issue affected HD 5xxx and newer cards. It caused VMMaker not recognizing the driver.